I originally posted this series to my blog but I thought it would also make a great addition to Platformability because at Caplin we’re very concerned with understanding our users on a deeper level than just their day-to-day lives. Ever since I found the blog ‘What Makes Them Click’ by Susan Weinschenk, I’ve been fascinated with her writing. I’m a natural analyst, much to some people’s dismay, as I mentally poke and prod people till I really understand what drives people to behave the way they do. This has led me to study Product Design, Anthropology and to now be employed in the UX industry in an attempt to understand people and better their human experience. So when I read Susan’s post on ‘The Psychologist’s View of UX Design‘, I was fully engrossed in what she had to say on the matter. Her article broke down several areas of study relating to the brain, memory and the visual systems in humans to explain how these are relevant to UX. I don’t want to spoil the article just yet as over the course of the next couple of weeks I will break down Susan’s post and further explain my understanding of each of her ten points and what this has meant to my experience of UX thus far or the direction I’d like to take my own UX practices within a professional environment. In the mean time, I will list the ten points that Susan makes in her post. 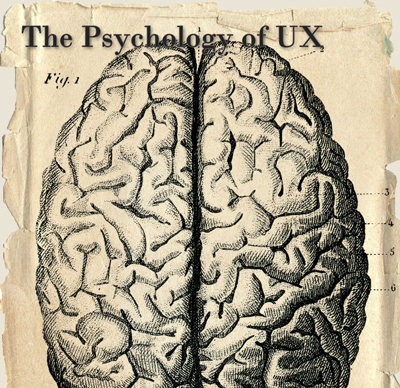 Keep an eye out for the upcoming ‘Psychology of UX’ series I will be posting over the next couple of weeks!